Heavy clouds ploughed up the sky as we rode along the coastal path through Dunkerque. Factories coughed out smoke to our right and to the left the beach had been tarmaced over - this is one bit of coastline that won't be eroded, even though it well deserves to be. The wind was cold, blowing down from the north and us, we were just happy to be on holiday. 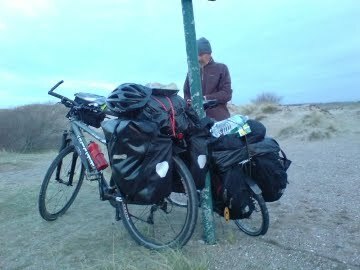 Soon, we left Dunkerque behind and moved slowly towards the Belgian border where we found cycle paths and then a campsite late evening. The site looked closed and quite possibly was, but nonetheless the owner turned up in the morning for his money. The clouds were still with us in the morning on the coastal route to Oostende. It was damp and cold and that holiday feeling was on the wane. 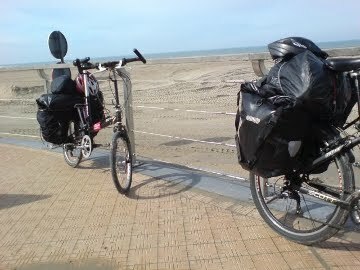 The cycle lanes were good though and the road was flat as we carried on north, arriving in Oostende in time for lunch. We even got a flurry of sunshine. We didn't hang around in Oostende because, apart from eating and drinking coffee, there wasn't a huge amount to do. 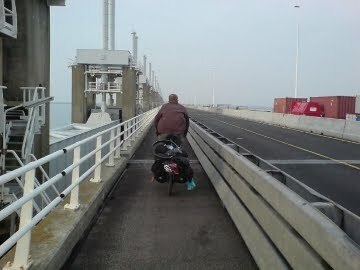 The riding was easy and with no wind to speak of, we reckoned we could reach Holland by the end of the day. We wound our way inland touching the outskirts of Bruge and continued to head north east. 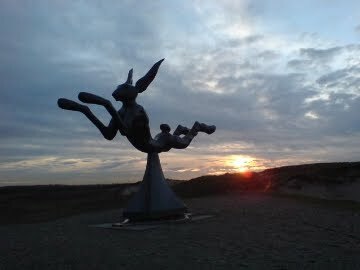 A few miles from the Dutch border, I asked for directions and completely misunderstood the answer. So, with darkness setting in, we found ourselves pushing the bikes across sand dunes. For a mile and a half we pushed until we saw the dunes drop down into an estuary. The tide was in and there was no way across, and even if there had been, there was nothing but sand dunes at the other side. It started to dawn on me that we'd gone wrong. 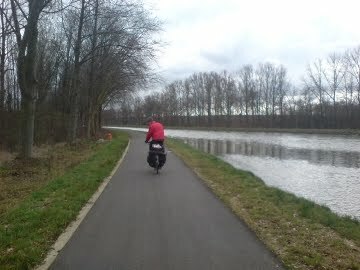 Twenty minutes later the cycle paths were red and altogether neater and we'd arrived in Holland. We waved goodbye to Otto and headed off in search of a campsite which we found in a small village close to the border. Dutch cycle lanes are amazing. Actually, they're not, they just offer continuous safe routes throughout the country. But to an English cyclist that's amazing. All day long we were amazed and talked about how great Holland was. By the evening we'd reached the ferry port to one of the polders. We camped and headed down to the ferry early. Now, this is written in retrospect, so I'm relying on memory. What I recall of day 4 is open spaces, breezy bridges, blueish skies and flat lands. Not terribly exciting stuff, but then much of Holland felt suburban. 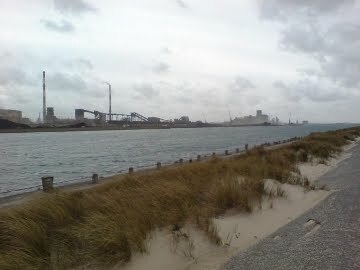 The sea defences are something else though - huge, complex guardians of what the Dutch hold dear. We found a 'mini camping' in the evening, had a shower and went to bed early. The following morning the sun appeared for a couple of hours, so we took advantage of the warmth to dry out pretty much all that we had in our possession. I seem to remember we had an argument later on in the rain and I remember pedalling off in righteous annoyance. Next thing I remember is us arriving in Breda in the evening, so I can only assume we made up somewhere inbetween. We wandered into a pub to ask where the campsite was. We were welcomed by the locals in a warm atmosphere and even warmer pub. We had a beer and a chat about the virtues of Breda before drifting off down the damp road to find the site we'd been directed to. Heading out east now towards Maastricht and zigzagging back and forth between Holland and Belgium, we found ourselves on one of the RAVel cycle routes which run along the country's rivers (have a look here for a detailed map of Belgian waterways). Easy riding and good progress through Liege and then onto the shopping centre that is Maastricht; wide roads, no soul and cold winds. 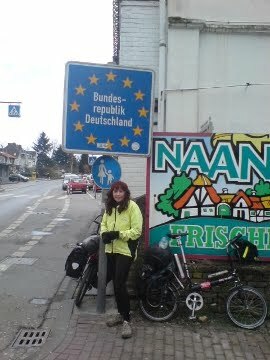 Today we crossed the border into Germany and it snowed. We rolled through Aachen, stopping only for coffee and self-congratulation in a bus stop before climbing into the Eifel mountains. A perpetual straight road with only us and thousands of cars. After an afternoon of climbing, we decided on a change of plan. Instead of pressing further into the Eifel Mountains, we decided to make the tour a round route and cycle back to Calais. So we took a right towards Eupen and in the dark, freewheeled for 10 miles on a descent with oncoming traffic, potholes and snow to either side of us. Eventually and gratefully, we saw the lights of Eupen approaching and dropped into it. 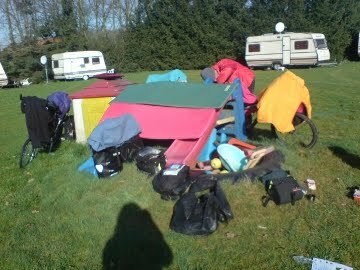 There was a campsite which was closed and a woman in a caravan who didn't want to speak to us. We left the following morning without paying because there was no one who would take our money. Rolling through Belgium, we had breakfast in a bus stop and eventually arrived in Liege. We confidently went the wrong way and headed south, hopelessly off-course. Janyis made the point that the river was flowing in the wrong direction which meant nothing to me. When I finally listened, we were miles from where we wanted to be but we'd had a nice ride on the RAVeL cycle route. We climbed out of the valley we'd camped in and rode straight into a headwind. As the day went on, the hail came and the wind picked up. We hid behind trees to make coffee and got increasingly wet and depressed. We arrived at Lidl on the outskirts of Dinant at nightfall and cheered ourselves up with some pre-packaged junk food, before the descent into the town. Rush hour on a steep hill in the dark, my bar bag fell off the bike and I ran over it before Janyis did the same. My fingertips were hurting really badly, Janyis' knees were red and swelling with Bursitis and she'd been secretly crying. We got into town and found a pizzeria where they let us hang dripping bits of cycling gear over their radiators to dry whilst we ate their pizzas. Enough was enough, it was time to go home. We found the campsite on the outskirts of town and the following day caught the train to Calais. Janyis got blown off her bike twice as we rode to the port. The ferries were cancelled because of the 60mph winds. At 3am, after sleeping in a toilet for a couple of hours, we managed to get onto a ferry and back to England. In Dover, the train station was locked, so we went back to the ferry port and slept in a waiting room before catching the bus replacement service back to Brighton the following day. All in all, a fantastic holiday.